American philologist; born at Meretz, government of Wilna, Russia, Oct. 15, 1866; son of Isaac Margolis; educated at the elementary school of his native town, the Leibnitz gymnasium, Berlin, and Columbia University, New York city (Ph.D. 1891). In 1891 he was appointed to a fellowship in Semitic languages at Columbia University, and from 1892 to 1897 he was instructor, and later assistant professor, of Hebrew and Biblical exegesis at the Hebrew Union College of Cincinnati. In 1897 he became assistant professor of Semitic languages in the University of California; in 1898, associate professor; and since 1902 he has been acting head of the Semitic department. 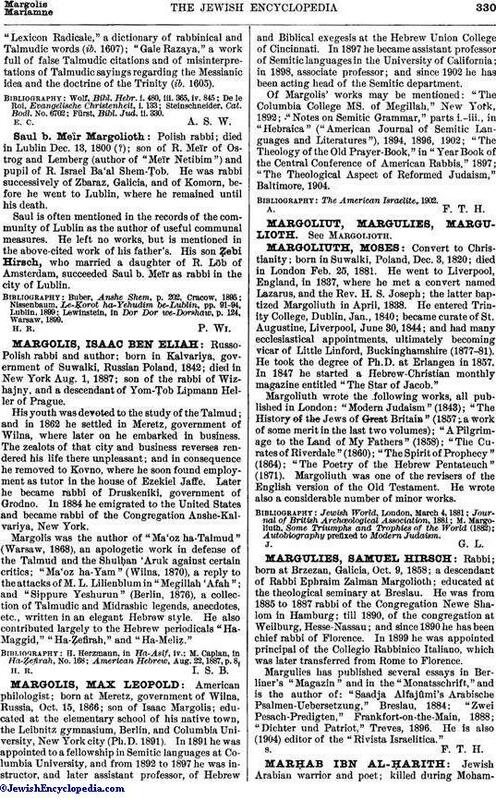 Of Margolis' works may be mentioned: "The Columbia College MS. of Megillah," New York, 1892; "Notes on Semitic Grammar," parts i.-iii., in "Hebraica" ("American Journal of Semitic Languages and Literatures"), 1894, 1896, 1902; "The Theology of the Old Prayer-Book," in "Year Book of the Central Conference of American Rabbis," 1897; "The Theological Aspect of Reformed Judaism," Baltimore, 1904.